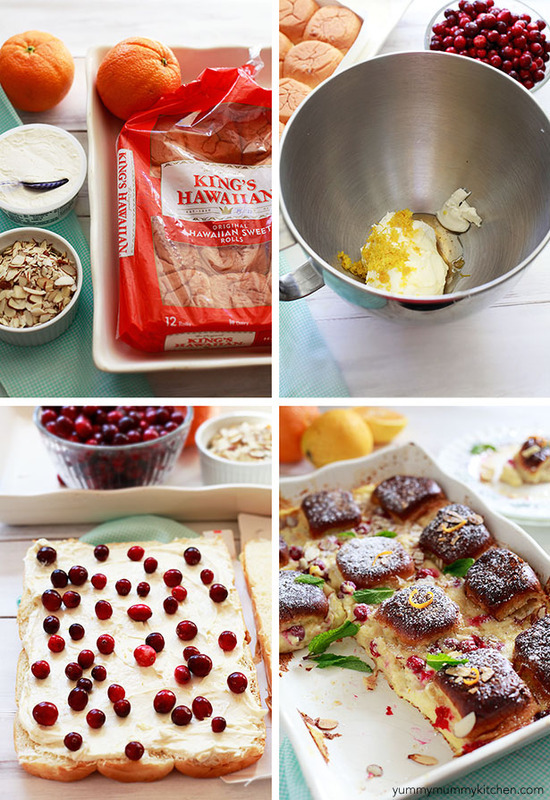 Tart fresh cranberries are the perfect holiday addition to orange and cream cheese stuffed French toast made with KING’S HAWAIIAN ® Dinner Rolls. Special breakfasts are almost always a sign of a special occasion in our house. During the week we have quick and healthy breakfasts before school, but on holidays and birthdays I like to splurge a little and make something sweet. Baked French toast is one of my favorite breakfasts to make because it’s so much easier to make as a casserole than to fry batch after batch. I spotted fresh cranberries a few days ago and grabbed them up. Since fresh cranberries are only around for a few months, I get pretty excited to see them. They add a delicious tart bite to anything sweet. I love them in pumpkin muffins, but thought they would be fantastic in a baked French toast. Rather than use sliced or torn bread as I have in the past, I used KING’S HAWAIIAN ® Dinner Rolls. 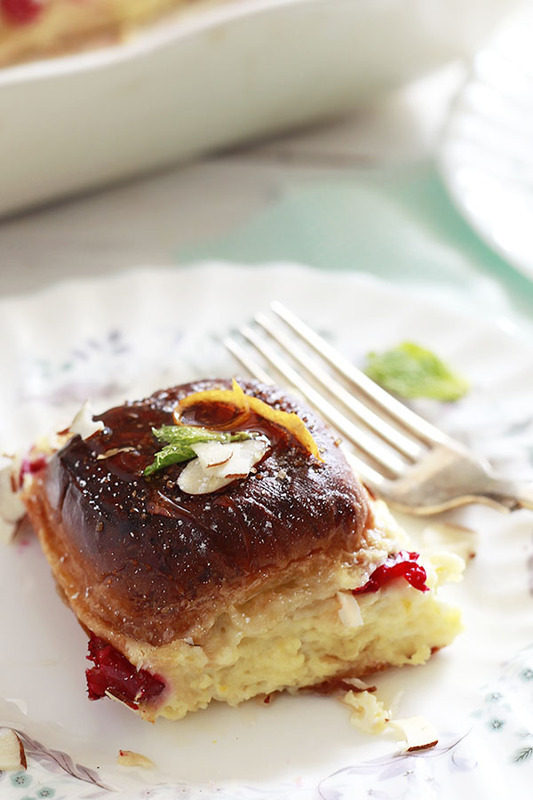 My family loves these sweet rolls and they create perfectly cute individual portions of baked French Toast. An orange cream cheese mixture is used for the filling, but If that doesn’t strike your fancy (let’s bring that saying back, okay?) 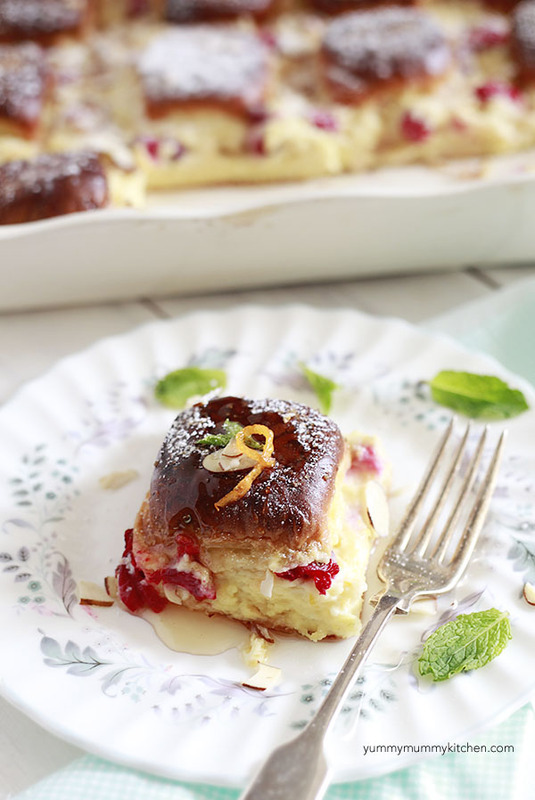 you can make a quick filling with a layer of marmalade and the cranberries. That being said, the cream cheese-orange zest-honey mixture is simply amazing on bagels. Or right off the beater. An egg and milk mixture is whisked together and poured over the stuffed rolls. You could fill the rolls with the cream cheese mixture and cranberries the night before and pour the custard over the top in the morning. I used a 9″ x 13″ baking dish for the photos. There was a little too much space between each roll for the egg mixture to seep into and bake. The second test of this recipe with a 7″ x 11″ dish worked much better, so that’s what I’m so I’m recommending in the instructions. Top your French toast with honey (my personal favorite) or maple or coconut syrup. Make it even prettier with a garnish or fresh mint leaves, orange peel, or a dusting of powdered sugar. Doesn’t that just look like the holidays?! I love the bright red color cranberries add as they pop. Cut the rolls in half crosswise with a serrated knife. In the bowl of a mixer, beat cream cheese, 1 tablespoon orange zest, honey, and extract until very smooth and creamy. Spread the cream cheese mixture over the cut side of the bottom half of the rolls. Sprinkle 1/2 cup of the cranberries over the cream cheese mixture. Top with the top halves of the rolls. Gently cut rolls away from each other if still attached in one sheet. Coat a 7″ x 11″ baking dish with butter or cooking spray and arrange rolls in the baking dish. In a large mixing bowl, whisk together the eggs, orange juice, milk and orange zest. Pour the egg mixture over the rolls, gently pressing any rolls that float up back down. Use a spoon to scoop and pour the egg mixture from the edges back over the tops. Sprinkle remaining cranberries and turbinado sugar over the top. Preheat the oven to 350 degrees F and let casserole soak for 30 minutes. Bake for 45 minutes or until set, covering with foil after the first 15 minutes. 5 minutes before casserole looks finished, sprinkle with almonds to lightly toast. Cool 10 minutes and serve with maple syrup or honey. Garnish with fresh mint leaves, orange peel, or powdered sugar. This recipe reheats well. If you need to bake it a few hours early, simply reheat in a 300 degree oven until warm, 10-15 minutes.